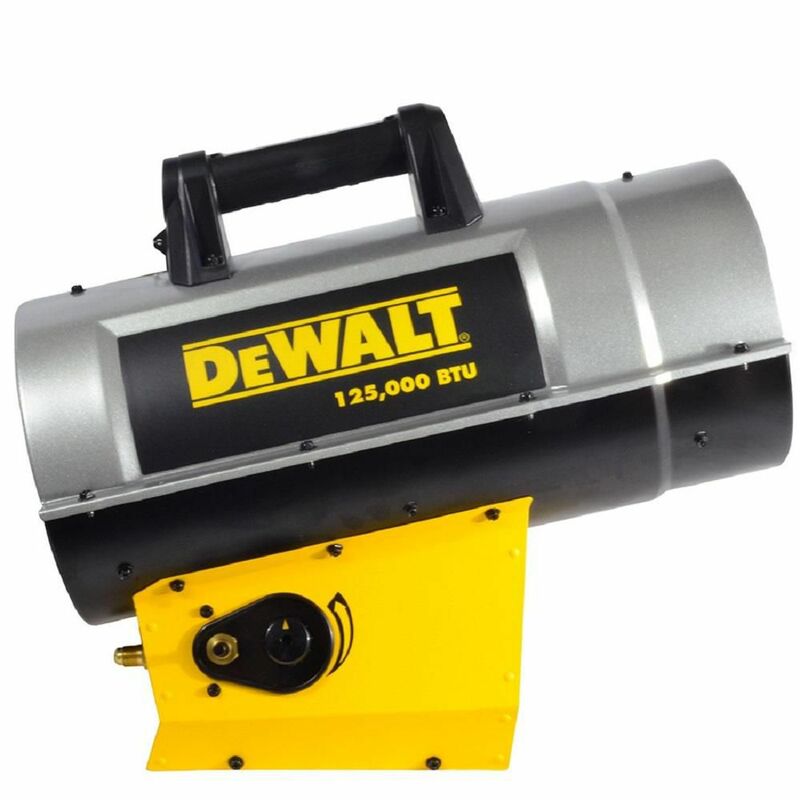 Forced Air Propane Heater 125,000 Btu F340720 DEWALT<sup></sup> industrial forced air propane heaters, are construction-grade quality built for the Canadian winter. They're manufactured with a rugged two-piece barrel, ergonomic handle, and engineered with Quiet Burner Technology (model 125 and higher). They're typically used for workshops, barns, job sites, and home remodelling. CSA approved, and tested on the jobsite, they're Guaranteed Tough. Forced Air Propane Heater 125,000 Btu F340720 is rated 4.1 out of 5 by 11. Rated 1 out of 5 by Bodyshop1 from .Only used for one week before we could not keep it running after releasing the start button. Fla... .Only used for one week before we could not keep it running after releasing the start button. Flame would go out immediately. Will have to return it. Rated 5 out of 5 by HomeDepotCustomer from Wow works better than I thought. I have a 40x65 work shop and it got it nice and toasty. Wow works better than I thought. I have a 40x65 work shop and it got it nice and toasty. Rated 5 out of 5 by HomeDepotCustomer from Really pleased with this heater. I have 4 car garage... Really pleased with this heater. I have 4 car garage and the winter time in the Memphis area gets the garage pretty cool at night. If I want to take the chill off when I go out there to work this unit does a great job quickly. You can't run it too long because it gets too warm. Rated 4 out of 5 by Paul from Product works great. heat a double car garage with me problem. The only thing about it is, it doe... Product works great. heat a double car garage with me problem. The only thing about it is, it doesn't have a thermoset to turn itself off when the room gets too hot. Rated 4 out of 5 by Zimmer from Easy to fix Have put 100hrs on it and it’s been working well. Couple times it shut off but think it was wind. Had to take it apart to clean out the nozzle and it was easy to work on. Schematic on the inside plate. Just a note that it runs on 20psi not inches of water, I’m running 12psi to it and it seems fine.